Some very special members supported our raffle quilt at the Amesbury Open Studio Days. Much appreciation goes out to Ann Hockmeyer, Rosalie Berard, Pat McBride, Margaret Tipton, Barbara Bell, Ann Hockmeyer, and Betty Hastings. Their efforts brought in $150.00 to our organization. An extra special thank you goes out to Brian Hockmeyer and Bill Hastings who came to help with take down. There were lots of good questions from non-quilters. “What is a long arm quilter?” Again, it seems that non-quilting events can bring us great PR along with some cash! With the end of the Mancuso show, we have one less major event for traveling. We encourage all members to think about other local venues that might work for us. This entry was posted in MVQ, Raffle Quilt, Travel Schedule and tagged Raffle Quilt goes to Amesbury. Our new raffle quilt is ready for her first journey. She will be traveling to Connections Quilt Festival on October 25th, 26th, and 27th. This festival is in Westford, MA at the Hyatt Regency Hotel. For new members, this is a great way to be with quilters from all over. We will pair you with someone who can teach you the ropes of being a Raffle Sitter. Please email judy.naylor@gmail with times that you can sit at the table. This entry was posted in Raffle Quilt, Travel Schedule and tagged Connections Quilt Show. Our raffle quilt is going to Lowell this weekend and we still have spots to fill for selling tickets and white gloving. Help is needed on; Thursday the 8th from 12-2, 2-4, and 4-6 on Friday the 9th another person is needed from 2-4 and 4-6. and on Sat the 10th at least one person is needed from 12-2 and 2 or more from 2-4. Please contact Carol Sullivan at casulli@comcast.net if you can help. Thanks to those who have volunteered already- I’ll be sending you a separate reminder of the time you volunteered for. Next week the quilt will be going to the World Quilt Show in Manchester. Help is still needed in many time slots on Fri. Aug 16, Sat. Aug 17 and Sun. Aug 18. To volunteer please contact Terri Gelinas at gelina5246@comcast.net. 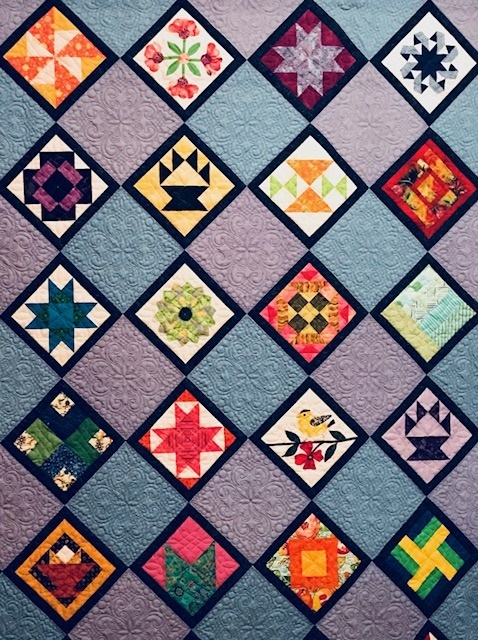 What better way to spend a day in August than visiting a quilt show and helping the guild, having a chance to wear those white gloves and being able to check out the quilts up close, taking a sit down break and selling raffle tickets and then going on a shopping spree. This entry was posted in MVQ, Raffle Quilt, Travel Schedule.